Robert Whitehill (1735-1813) is not very well known today, but it is not too much of an exaggeration to call him the father of the Bill of Rights. In 1787, Delaware became the first state to ratify the United States Constitution, and did so with little opposition. Pennsylvania would become the second state to approve the document, but it did so only after extensive debate at a convention that lasted from November 21 to December 12, 1787. There, the first voice heard to oppose the new document was that of Robert Whitehill of Cumberland County. Holding a 2-1 majority, the Federalist delegates had nothing to worry about in Pennsylvania, but Whitehill's persuasive argument that the Constitution lacked a guarantee for personal and states' rights rang true in state after state. Stating the anti-Federalist position succinctly, Whitehill declared that a bill of rights was necessary because "national freedom has been, and will be the sacrifice of ambition and power, and it is our duty to employ the present opportunity in stipulating such restrictions as are best calculated to protect us from oppression and slavery." The president, he argued, was too much like a monarch, the Senate like an aristocracy, and the clause making treaties approved by the Senate the supreme law of the land "eradicates every vestige of state government, and was purposely intended to do so." In response, Federalist James Wilson argued that a bill of rights was unnecessary because the people needed no protection from a government that drew its power directly from them, and a government set on subverting the people's rights would do so with or without a bill of rights. Whitehill, however, offered a more persuasive case. To obtain ratification in the other large states - Massachusetts, Virginia, and New York-the Federalists had to guarantee that the first Congress would consider and propose amendments to quiet the anti-federalists fears. A comparison of Whitehill's 14 points to the Constitution, the nation's "Bill of Rights," shows that eight originated from his proposals. So who was Robert Whitehill? A farmer from Lancaster County, and father of five sons and four daughters, Whitehall had been involved in the Revolution from the beginning as a member of the Lancaster County Committee of 1774-75, and member of the convention that wrote the state's first constitution in 1776. A member of the Pennsylvania Assembly from 1776-78 and 1783-1787, he served on the state executive council from 1779 to 1781, and the Council of Censors in 1783-84. A firm supporter of the 1776 constitution, Whitehill represented the rural residents of Pennsylvania who favored keeping power in the hands of farmers and others who strongly supported local and states' rights. 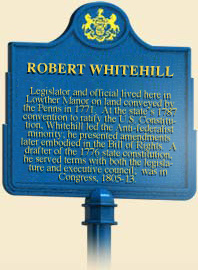 Whitehill also served as a delegate to Pennsylvania's state constitutional convention in 1790. Here he argued that the new, soon to be adopted constitution was too aristocratic and placed too much power in the hands of the governor, senate, and judiciary. He went on to serve in the Pennsylvania assembly from 1797-1801, and the state senate from 1801-1805, then continued to oppose judicial and executive power as a congressman from 1805 until 1813. A Jeffersonian, he wanted to limit judges" terms to ten years and give both houses of Congress power to remove the president by a simple majority. Throughout his forty-year political career Whitehall represented the considerable number of Pennsylvania farmers who favored local government and mistrusted the concentration of power in the state and federal governments. Today, many of his arguments still make sense to those who fear that the federal government - especially the president and judiciary - have usurped too much power from the American people. Robert G. Crist, Robert Whitehill and the Struggle for Civil Rights (Lemoyne: Lemoyne Trust Co.), 1958. R. Carter Pittman, "Jasper Yeates’s Notes on the Pennsylvania Ratifying Convention, 1787," William and Mary Quarterly, 3rd Ser. 22:2 (April 1965): 301-318. Robert G. Crist, ed., Pennsylvania and the Bill of Rights (University Park: Pennsylvania Historical Association), 1990.